Oh hello it is totally so easy to cook the meatballs right in the soup, especially if you've done prep ahead of time and have bread crumb, parsley, and bacon-onion mix in the freezer. In my last recipe I just rattled off fennel and beet as celery and carrot substitutes, I thought I would put my money where my mouth is. And hello, here's me eating my beets. Heat a little bit of olive oil in a large saucepan over low heat while you dice the onion, fennel, and beets, adding the vegetables to the pan as they are diced. When they're all in, stir them up and turn up the heat a bit. Also chop up any fennel fronds and beet greens and leave them aside for a moment. Add the stock and bring the soup to a strong simmer over medium high heat. I added two more cups of water to make the proportion of broth to vegetable right, it was a lot of vegetable. Soak the bread crumb in almond milk and squeeze it out, and combine with the parsley, bacon-onion mix, and egg in a large bowl, then add the turkey and mix all together. (I omit the tomato paste for cooking the meatballs in soup.) 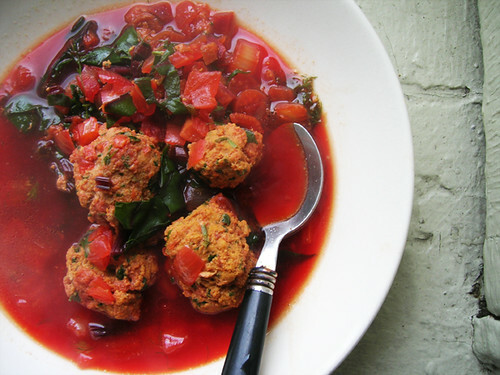 Form tablespoons of meat into balls, my mix made twenty-four small meatballs. When the soup is strongly simmering, drop the meatballs into the soup and let simmer about ten minutes until cooked. Add the fennel fronds and beet greens and simmer another ten minutes until wilted.